Shakhtar are Ukrainian Super Cup Winners! July 15, 2017. Odesa. Chornomorets stadium. Att: 34,163. 21 oC. The Miners opened the season with the match for the Ukrainian Super Cup, which they lifted seven times. For Paulo Fonseca, the game against the Kyiv side turned out to be the 50th in the capacity of Shakhtar head coach. For the clash against Dynamo, the Portuguese coach fielded Yaroslav Rakits’kyy and Sergii Kryvtsov in the centre of defence, as Maksym Malyshev paired with Taras Stepanenko in the defensive zone. 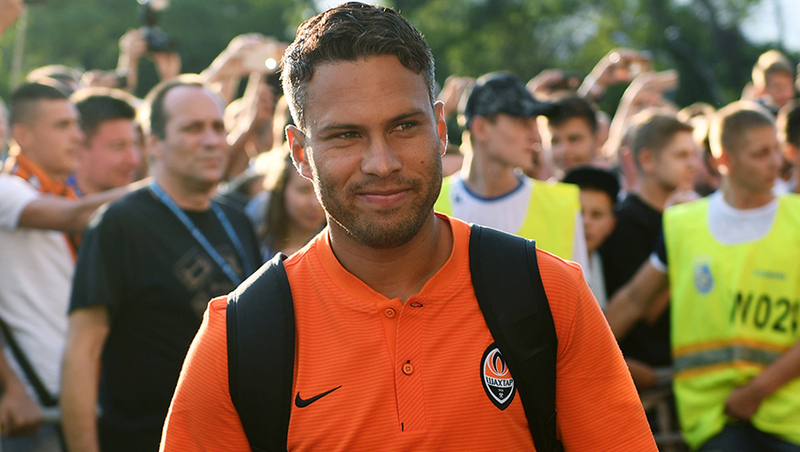 The Orange-and-Blacks emerged on the pitch of Chornomorets stadium wearing a new home kit. Opening minutes saw even game, although the Donetsk team quickly created a moment of danger. The teammates put clear Taison, which saw Dynamo goalkeeper managing to mop up the threat. Nevertheless, as early as in the 8th minute the Miners broke the deadlock. Andriy Pyatov instigated an attack, with Facundo Ferreyra tangling successfully, as Marlos and Bernard took the game into the left flank, from which Ismaily delivered a low cross to the goalkeeper's line, before Shakhtar striker appeared to be the first to the ball. The Argentine scored an opener almost into the open net to register a team’s debut goal in the 2017/18 season. Further, Paulo Fonseca’s men controlled the course of events, enjoying both playing and territorial advantage. The Kyiv side came to life closer to the 30th minute by creating their closest chance in the first half. Denys Garmash flicked a belter, before Andriy Pyatov was up to the task, with Diemerci Mbokani trying to tap it home on the rebound, but Darijo Srna was first to the ball at the last second. Before the whistle for the interval, the opponents operated at a calm pace to send the sides into the break with the score of 1-0 in favour of Shakhtar. The Donetsk side’s line-up was changes, as Viktor Kovalenko came on for Maksym Malyshev. The Miners could have double the lead in the 56th minute. Following a series of passes, Ismaily delivered a next cross from his left flank, with Facundo Ferreyra being the first to the ball again to make it 2-0. Soon the Argentine could register a hat-trick, but headed a set piece by Marlos wide. On 77 minutes, Paulo Fonseca fielded Dentinho in place of Taison. Literally immediately, the Orange-and-Blacks played shorthanded after Taras Stepanenko received the second booking. Nevertheless, Shakhtar players could have scored a goal. First opportunity came Marlos’s way, who did not beat the ‘keeper, which sprang out of a goal too far. Later on Bernard appeared on the shooting position to see Artur Rudko saving his team once again. In the late stages of the match, Ivan Ordets came out, replacing Facundo Ferreyra. In the dying minutes, Dynamo tried to save the situation, but the Donetsk side produced a clever defensive performance to claim a logical victory. Shakhtar are Ukrainian Super Cup winner in the 2017/18 season! The Miners will play Vorskla in their Premier League first round match on July 18. The meeting will take place in Poltava and start at 19:00.